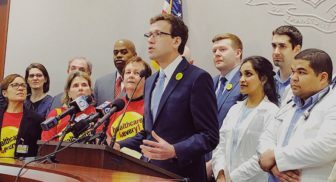 Sen. Matthew Lesser, center, D-Middeltown, stood with advocates and health officials earlier this month in announcing a new push for a public health insurance option in Connecticut. Under two proposals, officials would open the state health plan to nonprofits and small companies – those with 50 or fewer employees – and form an advisory council to guide the development of a public option. The measures would allow the state to create a program, called “ConnectHealth,” that offers low-cost coverage to people who don’t have employer sponsored insurance. If adopted, small businesses could join the state health plan as early as January. Less than half of Connecticut’s small companies offer health insurance to their workers, legislators have said, despite collectively employing more than 700,000 people – about half of the state’s workforce.